3 options to choose from depending on your skill level & sense of adventure! 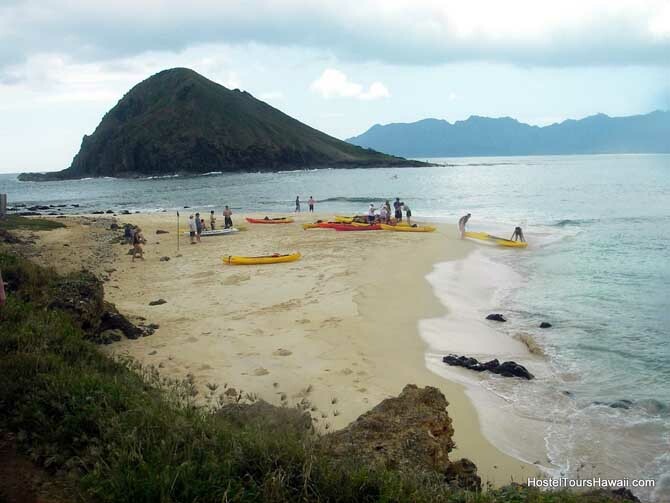 (3) Moku‘lua (The 2 Islands), which offers a remote beach, hidden tide pools, & secluded coves. Upon reaching the kayak shop, you will be given a kayak, life-vest, dry bag, snorkel equipment, lockers, & a FREE lunch voucher (hamburger, pizza, or korean barbecue- vegetarian option also available!) 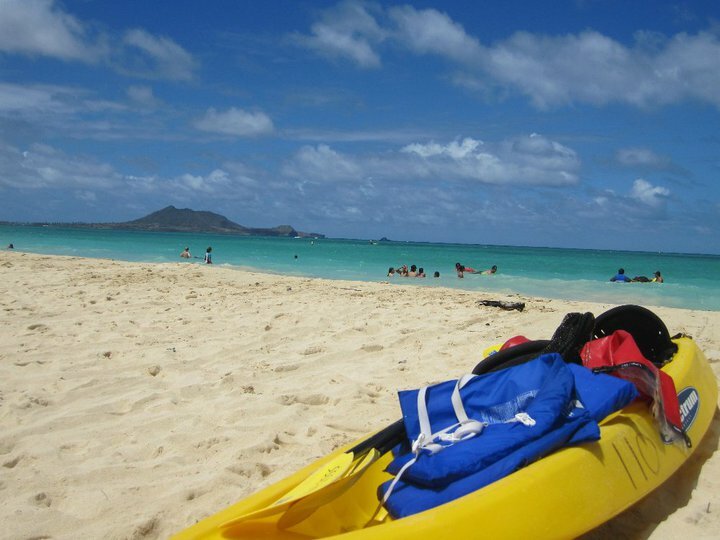 After a short safety video explaining how to reach your desired destination, you can head down to Kailua Beach (voted the best beach in the United States) where you will have 2-4 hours (depending on the package you choose) & the possibility of kayaking to one of the offshore islands or Lanikai beach (depending on package). Don't forget your sunscreen! 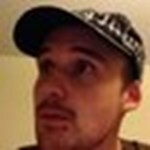 Japanese guides available! After that, the only thing you have to worry about is getting back on the shuttle in time to see the beautiful Waikiki Sunset! 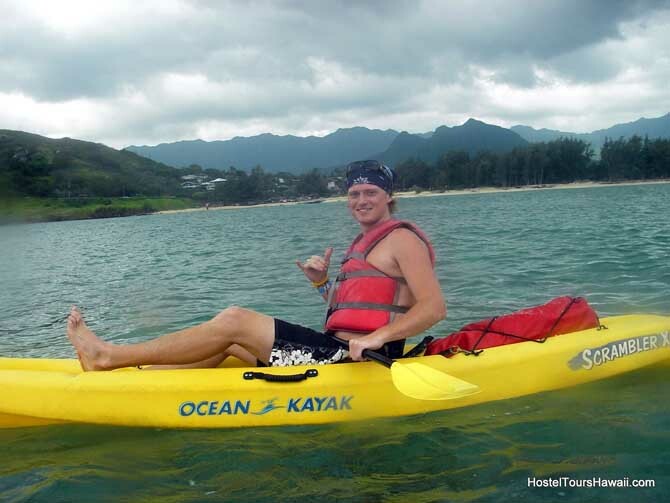 Ideal for Beginners looking for a Hawaiian kayaking tour with the safety of a guide in sea turtle feeding grounds; All levels welcome from kids 8 and up. Includes Snorkeling, Lunch and Hotel Pick-up. 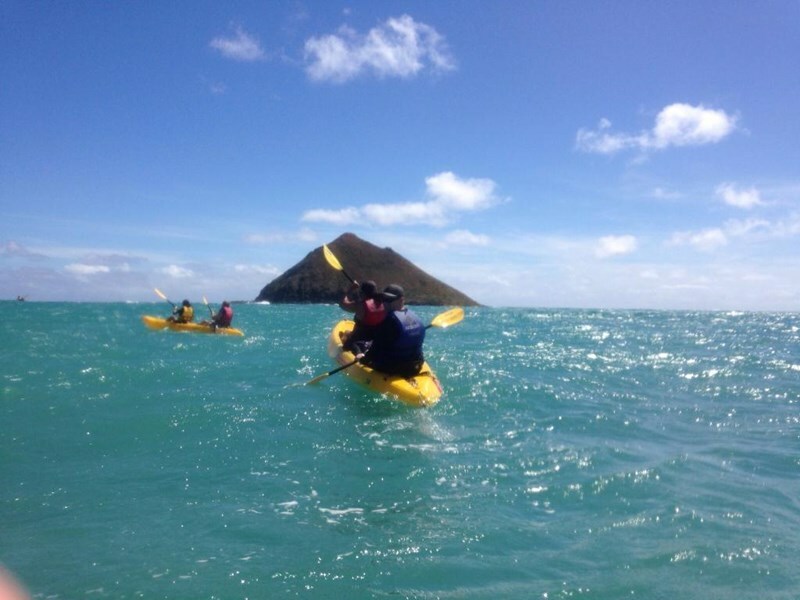 Join a small group and venture into Kailua Bay’s, near shore destinations. 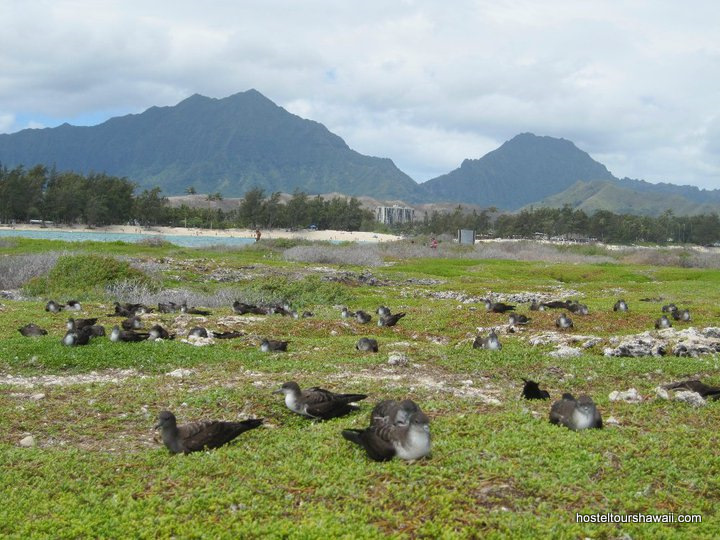 Visit Popoi’a Island and find the nesting sea-birds that these islands are protected for. The Ko’olau Mountain Range and Dormant Volcanoes create a backdrop full of Hawaiian and geological history to learn about.The Hawaiian Green Sea-Turtle makes these waters its home and will often make an appearance. 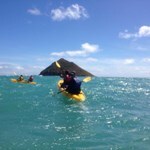 Itinerary: The Day starts when we pick you up from your hotel in Waikiki, usually between 8:00 and 9:00 in the morning. Those with their own transportation can choose from check in times throughout the day, starting at 7:15 am. You will be given a thorough briefing of the area and some basic instruction by one of our eco-guides. Set out for two hours of kayaking and adventure. Arrive at our shop for lunch, have a fresh meal and set out again, armed with snorkel gear or boogie boards, you decide. Use our shower facilities and change into some dry clothing and our driver will have you back in your hotel by around 3:30. Later pick-up times may be available, contact the shop for details. Tour times may operate on a reverse schedule, i.e. free time in the morning and kayak tour after lunch. What’s Included: We provide all the kayaking gear, including PFDs, paddles, backrests, drybags, island landing permits and snorkel gear. Guests can also use beach mats and boogie boards. We also have lockers for guests. What to Bring: Guests will get wet! Wear your bathing suit under your clothes for check in. Some sort of footwear that can get wet is required. Towels and a change of clothes are recommended. 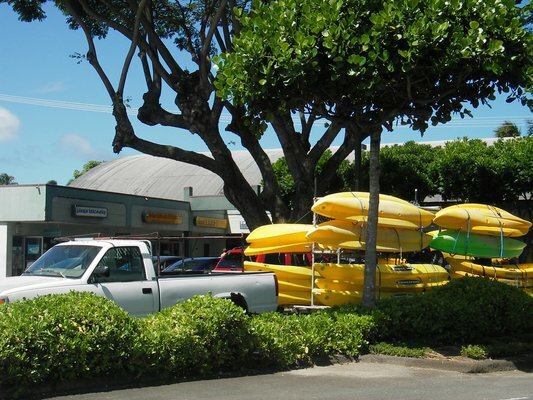 We have a full service water sports shop with everything you might need for your trip. 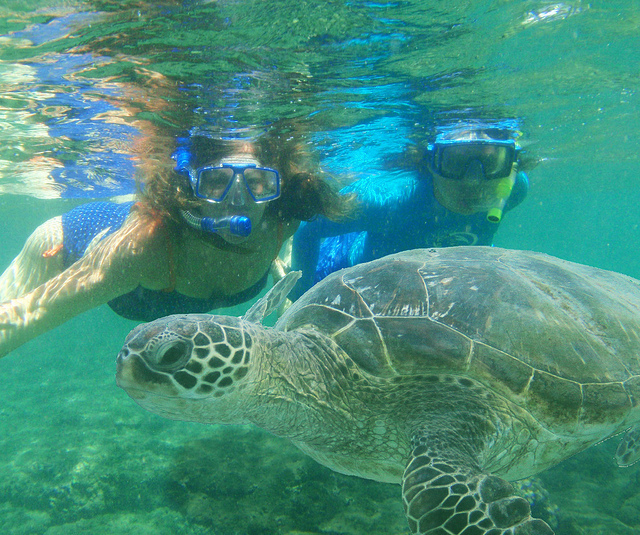 Previously the 4-Hour Adventure, now with more time for snorkeling and exploring! 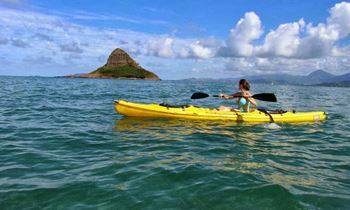 Experience the original Kailua Bay eco-tour, try kayak surfing, explore hidden tide pools and remote island sanctuaries. 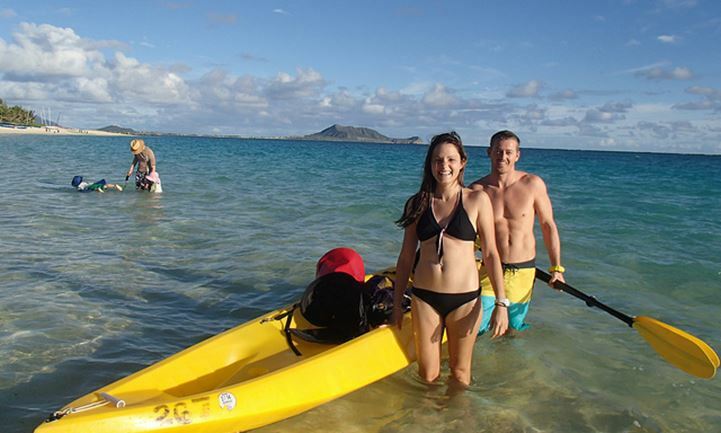 Fit for adventurers 13 and up; Includes Snorkeling, Lunch andHotel Pick-up. 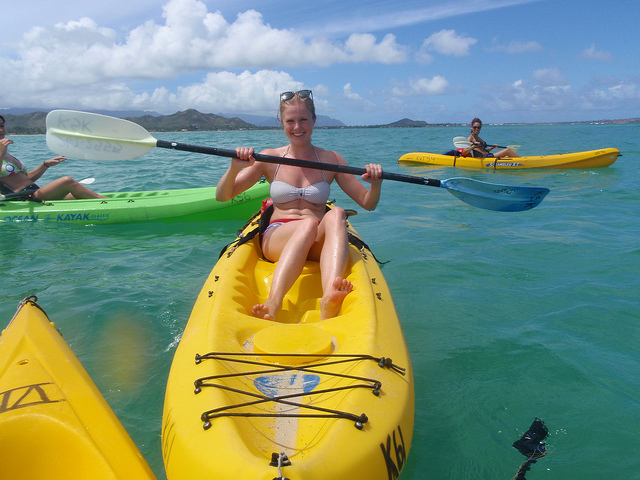 The authentic Kailua kayak tour (5-Hours) will have you understanding what all of the fuss is about. 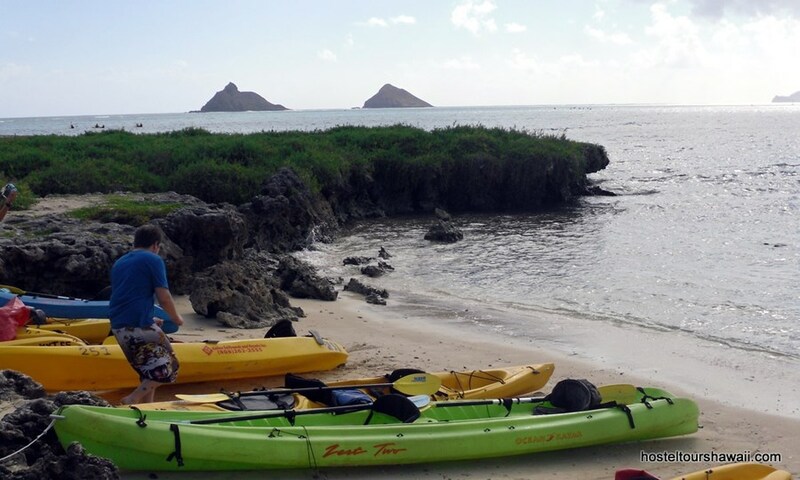 This is our recommended tour for athletic or experienced kayakers to get to see all of what Kailua has to offer including the Mokulua Island sea-bird sanctuary and Lanikai’s picturesque white-sand beach. 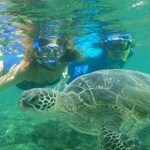 Snorkel with your guide in the live coral reef inside Kailua’s turtle feeding grounds and enjoy our tropical paradise. Itinerary: The day starts when we pick you up from your hotel in Waikiki, between 8:00 and 9:00 AM or check into our shop at 9:15 for those with transportation. 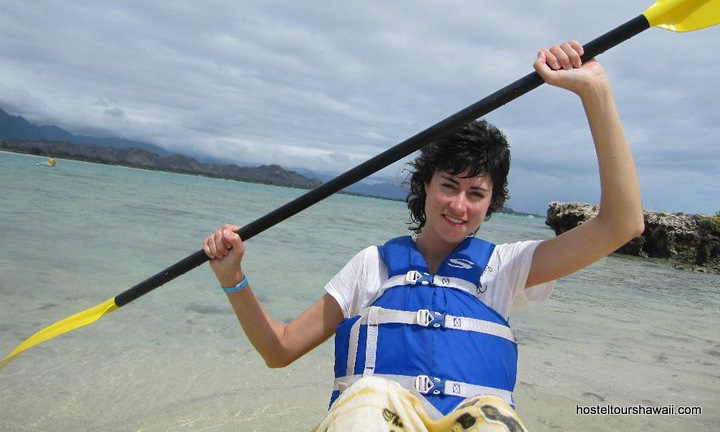 You will be introduced to your kayak guide and naturalist and outfitted with all of the necessary gear for the trip including life-jackets (PFD’s), lockers, dry bags and snorkel gear. 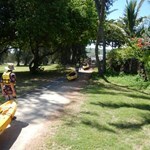 You will be given a thorough briefing of the area, some basic instruction on kayaking and the days schedule. 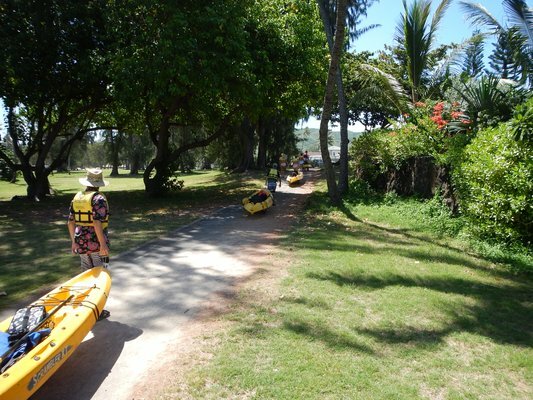 Kayakers then walk the kayaks to the beach on carts (about 5 minutes) and set out for the Mokulua Island sea-bird sanctuaries, about an hour paddle one-way. 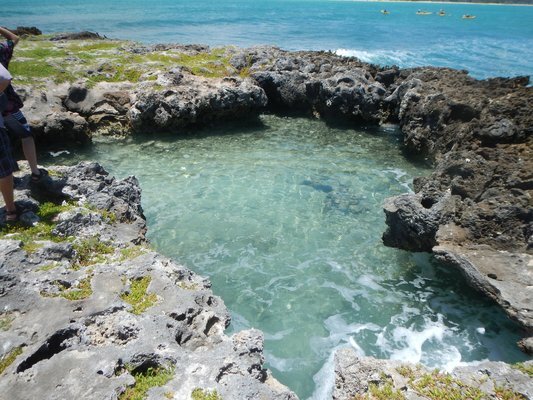 Upon landing on the islands deserted beach, embark on an eco-tour and tide-pool hike to Queen’s Bath. 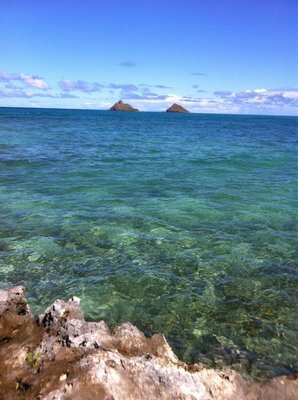 Next, paddle across Lanikai Beach’s turquoise waters, go snorkeling and enjoy a hand made deli sandwich, complete with fruit, drinks and healthy snacks. 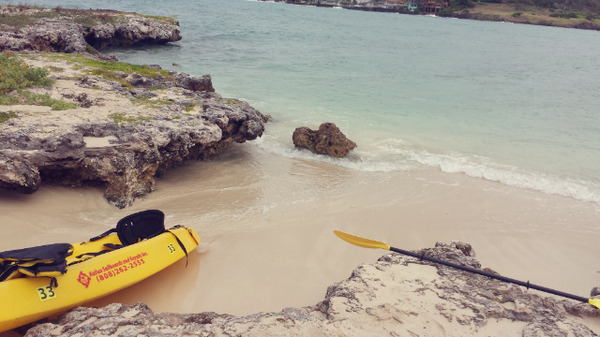 Guests will have a chance to kayak surf, explore the beaches or go for a swim. Arrive at our shop around 2:30 pm, use our shower facilities and change into some dry clothing. You will be on your way by 3:00 pm, or our driver will have you back to your hotel by around 3:30pm. Our Beach Center Shop carries all accessories like sunscreen, UV-shirts and waterproof cameras. What’s Included: We provide all the kayaking gear, including PFDs, paddles, backrests, dry bags, island landing permits and snorkel gear. We also have lockers for personal items. 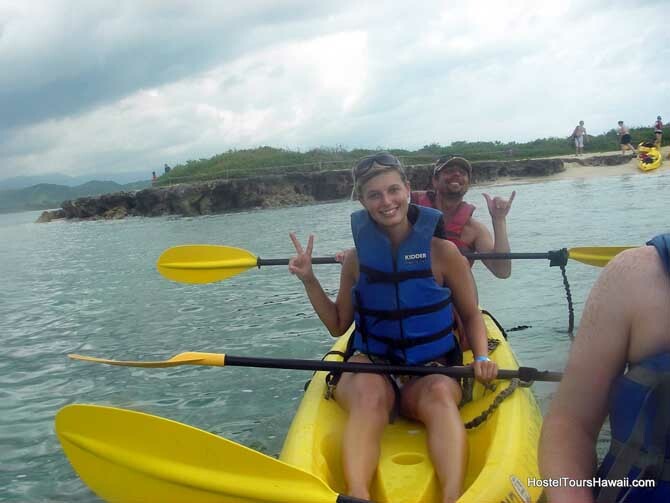 Restrictions: This tour is a favorite for the fit and adventurous kayaker. No experience necessary but recommended; or moderate physical fitness level. 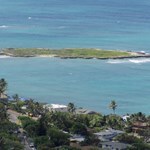 Popoia is located on the windward coast of Oahu about 1/4 miles offshore of Kailua Bay and resembles a flat slab of rock, hence it has been given the nickname of "flat island". 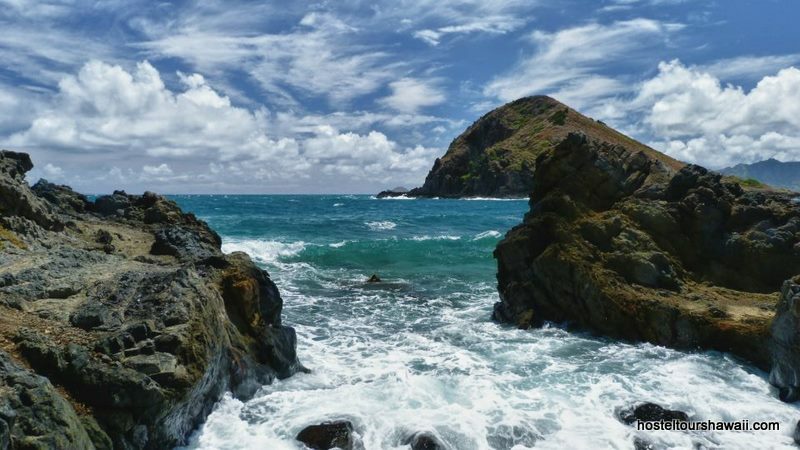 The island is recognized as a bird sanctuary, but when the conditions are ideal, it provides a good surf break which makes it a favorite playground for surfers and kayakers. The name "Popoia" means rotted fish which could be because there were once many fish bones found on the island. There used to be also an ancient shrine on the island where fishermen used to make offerings for their catch. Most of the structure had been destroyed by a tidal wave in 1946. 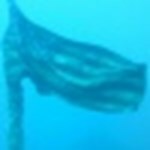 Because of being easily reached from shore, Popoia is favored among scientist who study the delicate ecosystem of the island. Bulwer's Petrel and Shearwater breed on the island. There are also a number of native and alien plants, most probably it is thought because of the activities of humans on the island. Although it looks flat, the island is full of sinkholes that are often used by nesting birds. 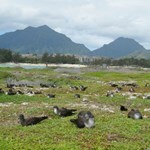 An estimated number of 3,000 seabirds are thought to be living on the island. The island is also a fantastic place for enjoying various types of activities such as swimming, scuba-diving, snorkeling, kayaking, sailing. 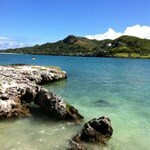 A small sandy beach is also found on the island perfect for sunbathing or just for relaxing. 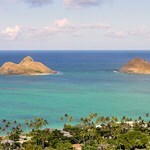 Popoia also offers a spectacular view of Lanikai Beach, Mokulua Island and Kailua. M, Tu, W, Th, F, Sa 9:00 AM - 9:15 AM Waikiki Area Hotels & Kahala Multiple check in times available if you don't need transportation, click on "book it" button to see availability. 12:00 PM - 12:15 PM Waikiki Area Hotels & Kahala Multiple check in times available if you don't need transportation, click on "book it" button to see availability. 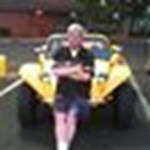 Most companies have a set of centrally located hotels that they do pick ups from. When you select your hotel in the booking page, you will see the pickup location and directions. This makes the pickup process short so you can start the tour as soon as possible! 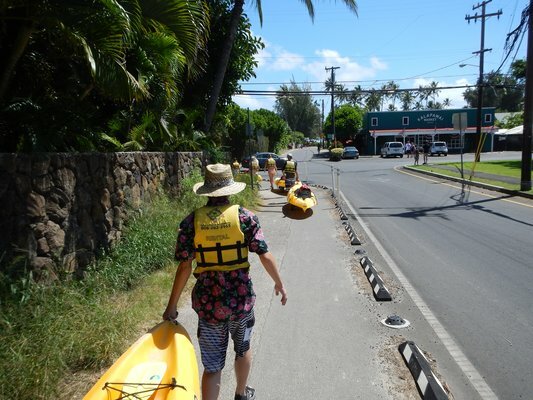 The only downside I would say is moving the kayaks yourself to the ocean, it was tedious. We helped us on our kayaks and we did some padding out in the sea and we taught us how to ride the waves which was pretty fun. Then we took us to the island of Popoia - it was an amazing island with an interesting story! 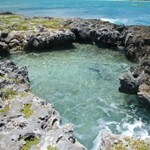 At the end of the island tour there was a little tide pool that we got to swim in. As we got back to the shore, we didn't need to put the kayaks back because there was another group after us (thank god because I did not want to bring those back - they were heavy) After we got back he gave us vouchers of where we wanted to eat - I did not expect this at all so I was super excited!! We had a choice between a hawaiian BBQ, pizza, and a supermarket with a deli. Of course we chose the Hawaiian BBQ place- that place didn't have a drink included so they let us grab a drink out of their fridge. Another thing that they surprised me with was that, after the tour, they let us use any of their equipment for the whole day until they were closed FOR FREE!! We ended up spending most of our day there. We rented bikes and snorkeling equipment and headed off to the beach. I really enjoyed biking to the beach so I recommend you rent a bike if you get the chance. Good equipment and the perfect place for a day of paddling. Great value - tour includes lunch and all the gear. 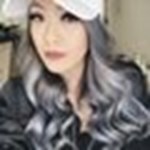 The staff was so nice, helpful, and patient. I especially loved that when we came back from our awesome kayaking trip multiple staff members genuinely asked us if we had a good time. We did! 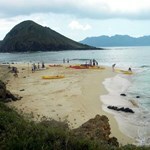 We had a picnic on one of the islands you can kayak to, and saw sea turtles swimming alingside us on the way back! 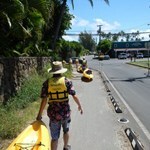 My only complaint was the trek to the beach, what a pain hauling a heavy kayak! But worth it! ... moreEnjoy! Would highly recommend this trip to everyone. Great day out. 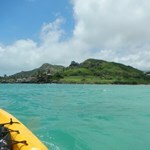 My fiancé and I traveled to Oahu in August and went Seakayaking through this company. Our experience was first rate. Our guide, Emily, was excellent, giving us god instruction and providing us with a lot of interesting information about Oahu in general and the little island that we kayaked out to. We will definitely go back to this company whenever we return to Oahu, hopefully sooner rather than later. Awesome day so much fun kayaking! 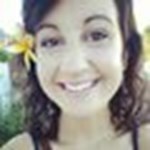 Would 100% recommend to anyone! Wow! 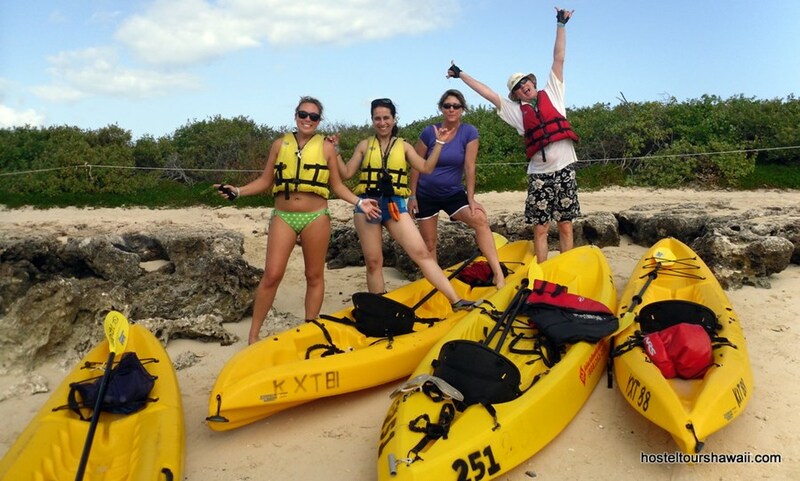 The kayak trip is certainly a big plus and a wet splash! Challenging, beautiful, and full of adventure! And with lunch, transfers and helpful staff, it is the best value for money tour! So if you’re looking for a challenge and a fun time, this is it! 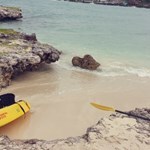 Really enjoyed the kayaking to the 15-20 min smaller island. We saw sea turtles on the way and one came up to say hello. They close at 5pm so if you want to go to the farther island do it before 3pm so you don't get a late fee. We went on our own, there are some private like tours but they work for tip. We had fun on our own and chilled at the island and swam with the turtles for a bit with the floaty. ... moreYou can buy a dry bag and put your thing in there. We put in your towels, phones, and bag. It floats and has an attachement. This is a nice way to see the beaches and enjoy your stay. 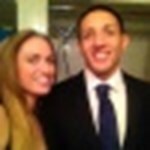 Would be fun to go with another person or couple too. 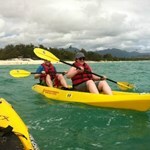 Having been to Hawaii several times I haven't had the chance to go kayaking. 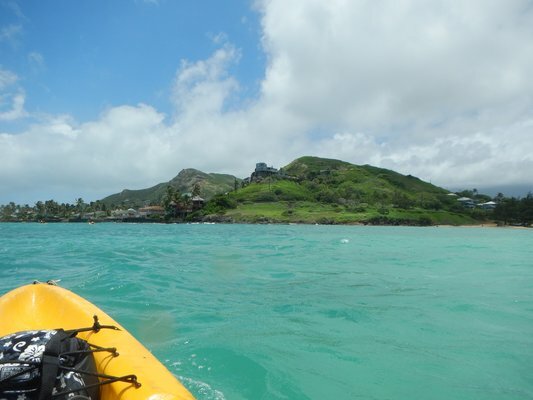 Taking advantage of the summer weather (and escape the winter chills of Sydney) I've heard so much on what a beautiful spot Kailua was so I thought what a way to spend a day & try my hand at kayaking. I couldn't have been more captivated. What a location & to paddle out and take in the scenery was something else! 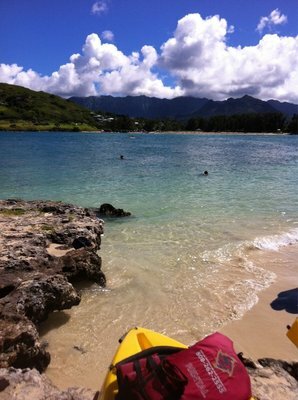 Couldn't ... morehave been more impressed with Kailua Sailboards & Kayaks....they totally made the venture so easy from go to whoa. Special mention to our guide Akela and with her local knowledge, being born & bred in the area, it added to the trip. 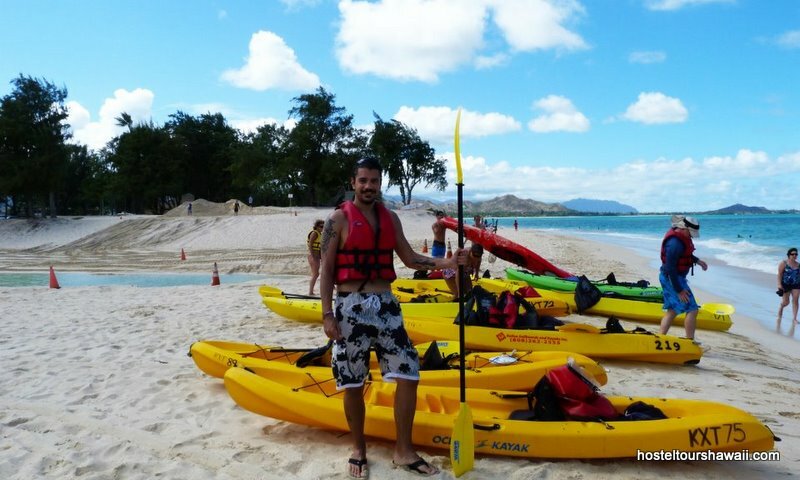 Definitely recommend this to anyone who want a break from the hustle & bustle of Waikiki and not to mention a great way to shed some of those kilos from the burgers & fries than a day kayaking. Our guide was awesome...The entire trip was fantastic. My fiance and I had never been on a kayak before, but the guide helped us out. He was extremely patient. Location was great. 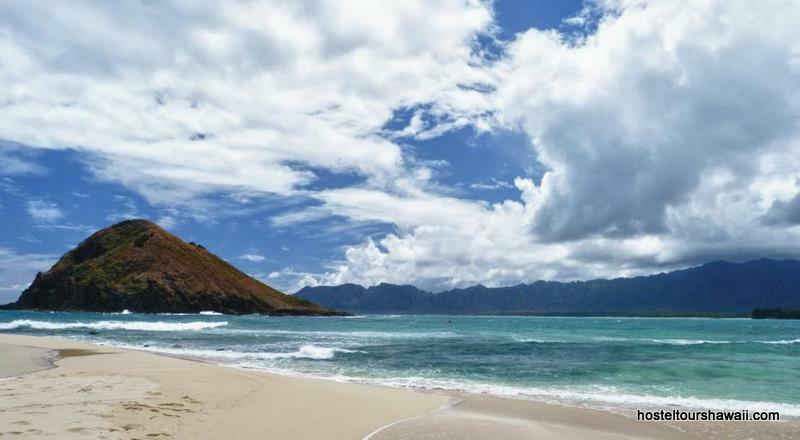 It is kind of a pain that it isn't right on the beach, but due to local regulations, commercial activity is not allowed on the beach (to keep it from becoming too commercialized like Waikiki). The walk was very short, so ... moreno complaints here. This is a good trip for everyone. The only thing I would recommend...bring your own food. The lunch that comes with the tours is not provided by KSK. You are given a voucher for one of the local restaurants. They all have limited menus for the vouchers. Our tour guide was Nate. He was awesome. 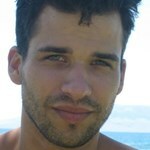 He took us out to the island and explained the history of it, as well as some local myths. He had endless patience with people new to kayaks, such as myself. I highly recommend this for EVERYONE. Kids, adults, couples, EVERYONE. I'm glad we came back again. They have definitely improved the whole experience here. 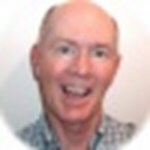 Everyone is very friendly and helpful. Viewing the informational video indoors is much better now. You can hear and understand the information much clearer. 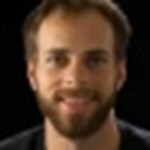 Which is important if you are novice or beginner Kayakers! We had a group a seven this time. 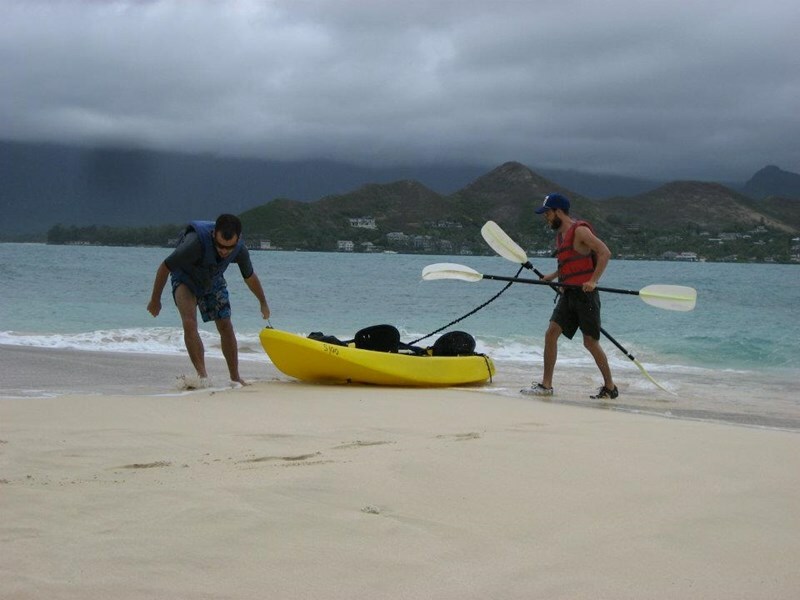 All of the kayaks and other items we rented were clean and functioned ... morewell. I wouldn't hesitate to rent here again. 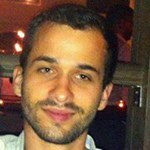 The whole process was very relaxed, informative and not rushed. 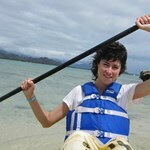 We were helped by Samantha at the counter who got us all set up with 3 double kayaks and 1 single. 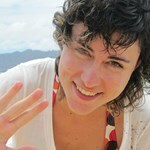 She was very friendly and had 'aloha'. After that we went to watch the informational safety video which was well done and gives you all the info you need. Then you head out to p/u your kayak. You have to pull your 'yak about 2 blocks to the beach. It is on wheels and very easy to do. My nieces and nephews had no problem pulling them down the road. The trip to Flat Island is pretty easy. 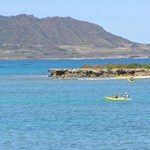 The wind was blowing the day we went so we decided to skip going to the Mokes because it was quiet a workout! 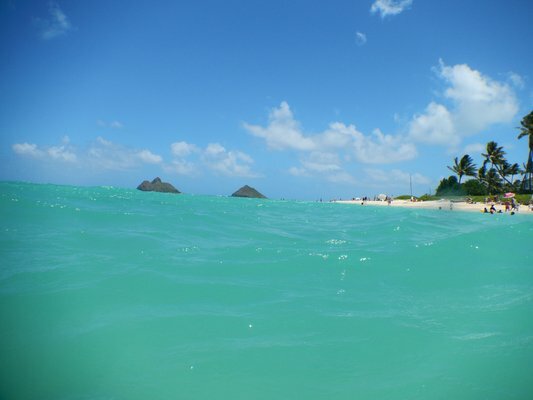 Instead we pulled up on Lanikai beach and just hung out in the awesome water. Also saw turtles swimming around in the water where we were hanging out. 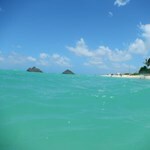 Lanikai Beach is one of the best spots on earth!! We had a great experience (except for the wind)........ this place was great to deal with! They also offer a yelp check-in offer and facebook check-in offer.. so check the board when you get there. Also, they have coolers so bring a sandwich to eat on the beach later!!! My boyfriend, and another couple that was a part of our group decided to opt out of the event. We were told by the workers at the beach that we would be refunded in full. However, we had gotten back to the rental to find out we could only be refunded in credit to their store to come back another time, with no expiration date. I'd like to come back and have the full experience of kayaking without the weather malfunction. The workers here are very friendly. I'd think it'd also be helpful to add that my boyfriend had lost his tank top and realized he left it back in one of the kayaks that they had put into storage since it was past closing time. They were eager to look through the rows of kayaks and retrieve his tank top! My family and I did the kayak trip where we paddled out about 2.5 miles to the little island. Matt and Nate were wonderful, fun, easy-going guides and we had a great day! 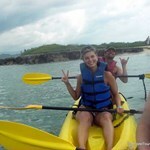 The little island has great rock formations and tide pools and we even saw a sea turtle on the paddle out! As a bonus Matt even took pictures and posted them on google drive which was awesome! 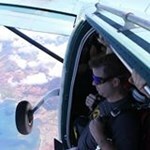 I would definitely recommend this activity ... moreto anyone visiting Hawaii. They were super good about getting us out on the water in a short period of time. They set us up and even provided a few freebies (seats and a wet bag). They set up the chairs of Course to make it easier. The only catch is you have to pull The kayak yourself. It's not bad as the water is maybe half a mile away and the kayaks are super light at first (it's harder on the way back especially if you had ... moretrouble with the trailer. Friendly staff (they actually work on the beach too!!!). 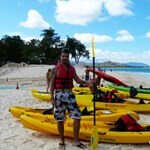 Went to Kailua for a kayak tour with a group of 6 hostelers. We had a couple days of rain and hurricane winds, but the water was calm. Amazing views from all directions- look down, there's a turtle, look inland, amazing view of the mountains, look ahead- deserted island. Landing on that little beach was so awesome. 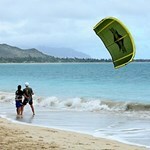 It was a smooth ride to Lanikai beach where we stopped for a short break and some pictures. 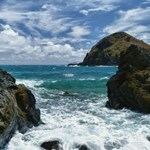 ... moreThen we headed to Molokua Island. Saw a beautiful Hawaiian Sea Turtle on the way there, poking its head out of the water. It was cloudy so we didn't get a great view of the mountains. 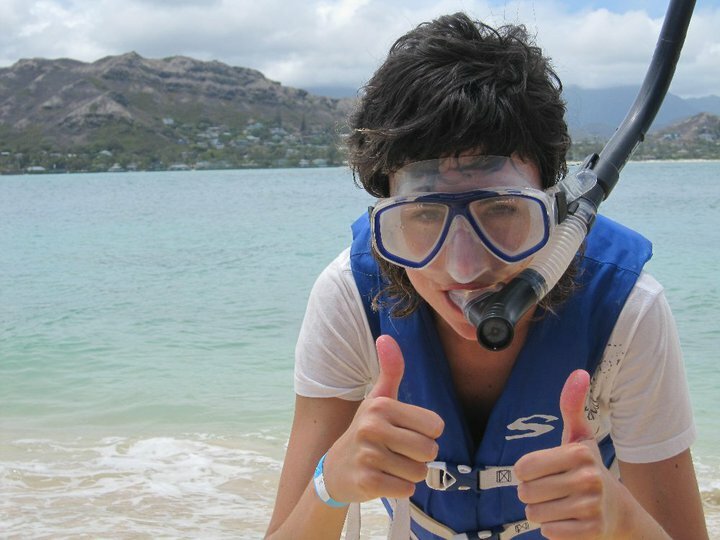 We spent most of the time snorkeling. Headed back and ate some pizza at Bob's. Best pizza since I left Brooklyn, I recommend Bob's special slice. 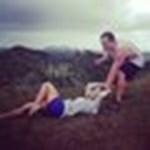 Best thing to do in Kailua! My boyfriend and I wanted to kayak to the mokes but then it was a bit late in the afternoon so we didn't have enough time for that. Instead, we decided to pull over in the closer flat island that took around 15 minutes. I had kayaked in middle school but had never tried a two-people kayak.. Compared to the single kayak, the double kayak was a more couple-sy experience, I guess..... need to agree ... moreon the direction and where & when to pull over the kayak, etc. Overall, we had so much fun and it was a good little exercise of the day. The weather was cloudier and windier than usual according to the staff, so we didn't get hot or sunburnt. Also, there was no one in the island due to the weather so it felt like we had the whole little island to ourselves ;) it's quite beautiful and romantic there. My significant other (from Brooklyn) wanted to go kayaking while we were here for our vacation. 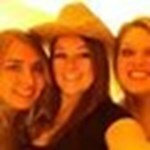 The staff was friendly, professional and amazing. Overall great customer service. Did this with a friend. It was good because you get everything you need plus free lunch at one of the nearby restaurants! 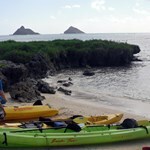 We saw sea turtles, birds & kayaked to the furthest island, "the mokes" as they call it over there. 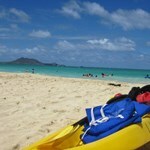 The water was really clear so we stopped at Lanikai beach and snorkeled for a bit. 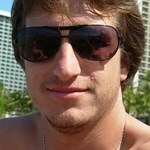 One tip, where sunblock!!!! I got burned cause I didn't wear enough. When I come back here and want to kayak out again, I will come back here hands down. Great experience!! 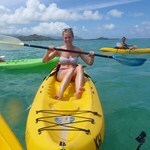 Kailua Sailboards & Kayaks were AWESOME! We did the 5 hour kayak tour to the twin islands, and we loved it! It was pretty difficult getting out there since it was windy, but it was worth every splash to the face. Matt and Nathan were our wonderful tour guides. Not only were they really knowledgable about the ocean and the island, but they were also fun to hang out with. We felt safe under their supervision. ... moreOn the way to the islands, one of the double-kayaks had a difficult time keeping up with the rest of us, so Nathan hooked their kayak to his and towed them along. 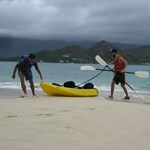 You know Matt and Nathan are professional kayakers or water-people when they can tow a double kayak in the ocean water. 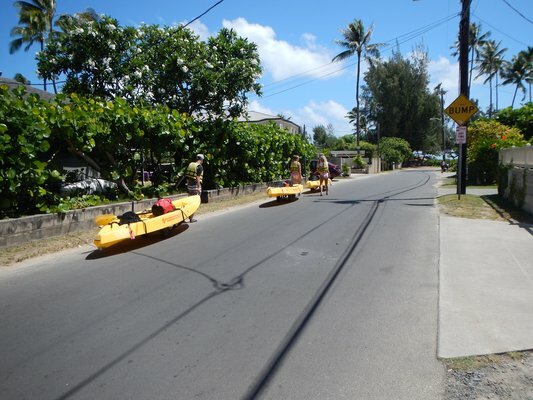 They also promote wildlife and marine preservation- we saw this when they had to educate another tourist kayaker from getting too close to the endangered monk seals basking on the sand. 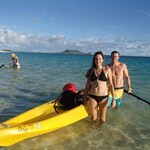 We had a great experience with Kailua Sailboard & Kayaks, and would most definitely return for another adventure. 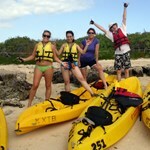 If you like a fun, challenging, wet experience, go ahead a give the kayaking a shot. It is not for the feint of heart, or the casual paddler, this if a full blown adventure! This self guided tour was in a beautiful setting and was so much fun. Lunch was provided as well as all equipment. There was a chance to snorkel so a waterproof camera is a must! We saw two sea turtles and many birds on the sanctuary island. We were lucky enough to have great weather but it still would have been a blast. Super excellent tour! The waves on the way to the small islands made for some nice kayaking surfing. Once you get to the island, there are some very interesting rock formations to hike upon. 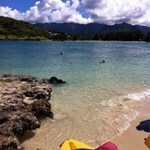 And a superb secluded beach to catch a one of a kind view of Oahu! 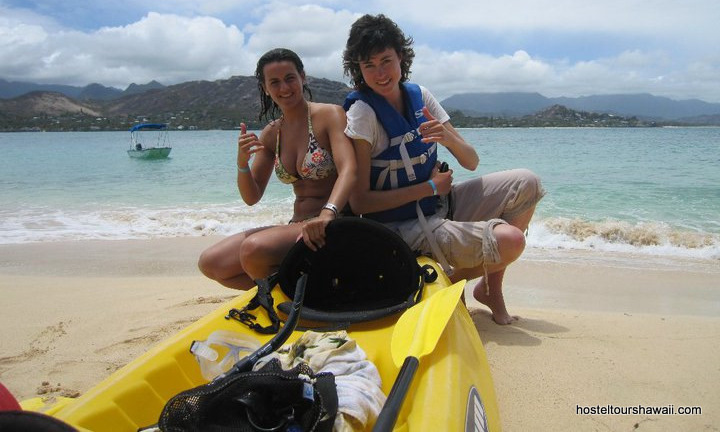 Who else can say he went from island to island by kayak:D Just amazing and for everybody possible. On the way I saw some sea turtles. 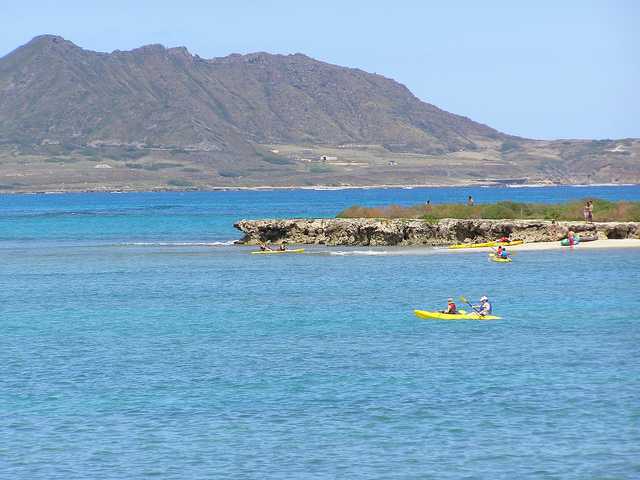 Kayaking in Kailua is a perfect balance of exercise and fun. One minute you're paddling head on with the current, and the next you are on an uninhabited island that is a protected bird sanctuary. Your adrenaline will be pumping the entire time. 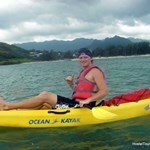 Kayaking in Kailua Jeff D.
In all my travels, sea kayaking in Hawaii with Hostel Tours Hawaii is one of the best things that I have done. We paddled out against the waves to a small deserted island and spent the day climbing around the cliffs and relaxing on the beach before coasting back with the waves and some mermaids while enjoying the view. All in all, a great day. I definitely recommend it! 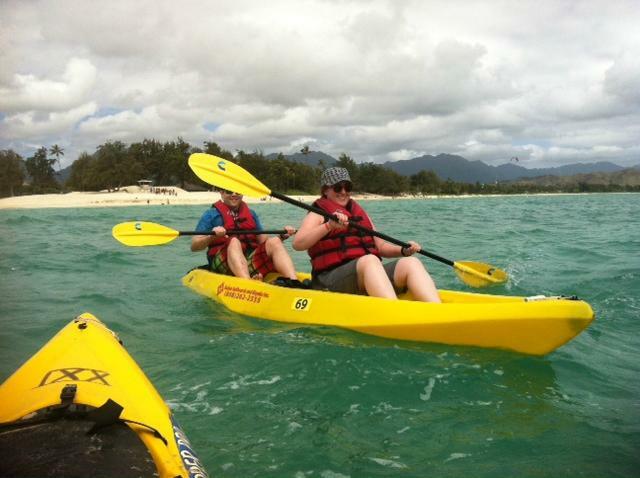 Kayak activity, fascinating! 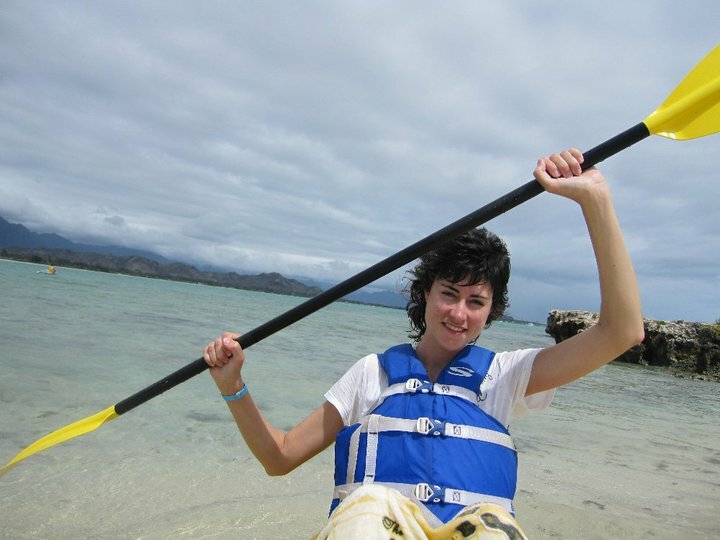 Maite F.
Another more awesome activities I've done, just for the view in front of me and was worth paddling and away from the edge of the beach to get to an island that was far away , so we got tired of rowing, but saw the giant tortoises around you already had enough! It was such a surprise to see them near me that I could not believe it was a dream come true . Despite that we had rain and the current made ... moreit a bit hard to paddle forward ! But worth it ! 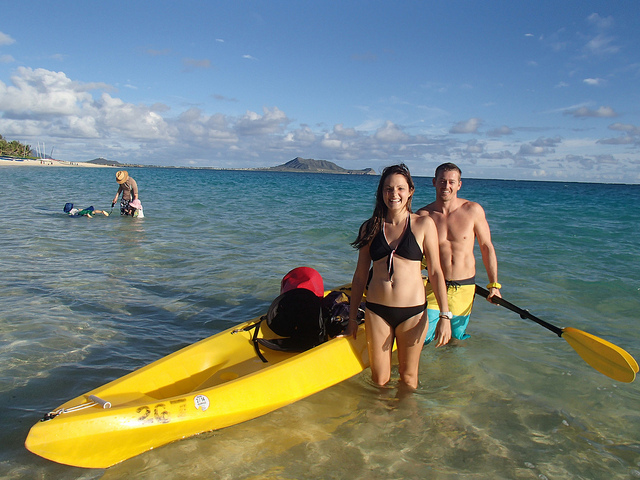 Self-guided kayak trip to Kailua Sarah S.
This was a beautiful trip. The driver was very friendly and super nice. When I got there I did the 4 hour self guided trip it was a beautiful sunny day with a little rain here and there but it felt nice. 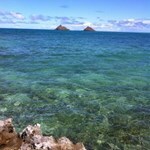 You get to choose 1 of 3 islands of course I picked the furthest away I like a challenge which was a good choice it was soooo beautiful it had an amazing beach and a awesome panoramic view of Kailua ... more:) I got some unreal pictures. It was a 2 mile paddle and it was a little wavy but so worth the paddle :) If your looking for a little adventure you can climb/walk half way around the island. 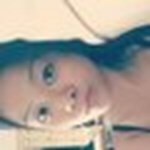 You have to check this out, ohh and for the ladies like myself out there I got the best tan ever that day if you burn easy for wear sunscreen the sun there is amazing and it sneaks up on you. 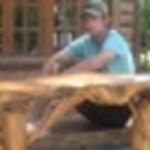 Check it out :) cheers. Man, I LOVED it! Larry D.
I was so delighted by the kayak adventure. It was so easy to sign-up and others also signed-up, so I met some new people and had a blast. 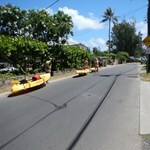 We met nearby for transit provided us in the tour across the island to Kailua. How easy was that? Driver was chatty and interesting. 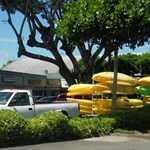 Upon arrival at the kayak place, the people quickly handled us with a smile and appreciated our business. We were in the water with ... moreour kayaks in no time! The Bay was calm and for a novice, the kayaking was surprisingly easy. I LOVED it. 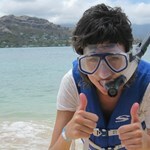 The beauty of the beach and the wonders of the undersea world of snorkeling were added bonuses. Believe it or not, after turning in our gear, they treated us to pizza at a neighboring grill. 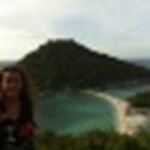 I am recommending this tour with great passion! Just Do It! 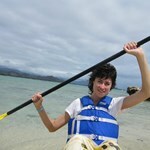 Last November, my wife Sunny and I took a kayaking tour of the Mokulau islands with Andy and Trevor as our guides. This was probably the coolest thing we did while on vacation! These guys were so knowledgeable about the area and really made us feel comfortable on the trip. From the time we were picked up at our hotel, to the time we were dropped off, the whole experience was friendly and memorable. 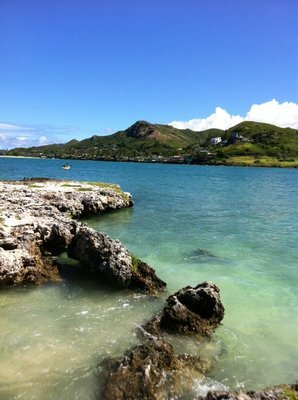 ... moreI definitely would recommend this to anyone traveling to Oahu without a doubt! Andy and Trevor, you guys truly have the best job!